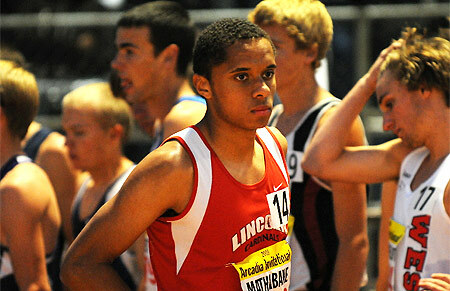 The name Nathan Mathabane has long been a familiar one to followers of the age group track scene, where he was a national champion well before he entered high school. As a high schooler, the Lincoln OR standout won his first Oregon 6A state title last spring in the boys 1500 at Hayward Field, after several close calls earlier in his prep career. That breakthrough, as well as a number of sterling times and a resume marked by good grades and impressive extracurriculars, saw Mathabane named the 2008 Oregon Gatorade Track and Field Athlete of the Year. This year, the Princeton-bound senior decided to bypass the Oregon high school cross country season for the second fall in a row, opting instead to train on his own. He competed unattached in a several autumn races before taking his shot at the Foot Locker West Regional in December, where he finished 73rd. Perhaps not the outcome he was seeking after his work though the fall, but his rebound this spring has been nothing short of breathtaking. Now under the guidance of Lincoln High distance coaches Suzanne Parry and Kathy Parker, Mathabane opened March 21st at the Oregon Preview with a 3:52.80/8:52.87 1500/3000 double, and followed that with a then-US#1 4:16.50 mile at the Stanford Invitational. He also burned an 8:29.62 3k for third at Stanford, hinting at the mark he was about to drop on his next foray to California, two weeks later at the Arcadia Invitational. There, Mathabane hung close to the leaders in the boys 3200, and then kicked hard in the final lap for a third-place, 8:59.96 finish in his first race at that distance. DyeStat senior editor Dave Devine plays a "home game," catching up with fellow Portlander Nathan Mathabane. 1) You've had a string of recent success in California the last two weeks, running a strong 3k and winning the mile at Stanford, and then dipping under 9-minutes for third place in the Arcadia 3200. Can you look back at those meets and take us through the races? What went well, what didn't go according to plan, and how do those races compare to your hopes for this point in the season? Yeah, the California races have really helped round me into shape in terms of my speed endurance. The first one (Stanford 3k) I ended up leading for the majority of the race before losing it in the last lap. Arcadia was pretty much the exact opposite, where I had to move up from near last to take third. The fact that there were 27 other runners in that race didn't really help my "slow-start" strategy, but it made it a lot of fun to run. I really wanted to break 9:00 in my first 3200, so I was very happy when I got that. I think, all in all, that I'm at a great place right now in terms of my ability to sustain a fast pace for a solid distance. Now comes the speed. 2) One interesting aspect of the Arcadia 3200 is that the top end of that race typically features a few Foot Locker finalists, but this year the top 3 finishers were all guys who ran Foot Locker West, but for one reason or another didn't make it to San Diego. Was it a confidence-builder for you to go up against a number of 2008 Foot Locker finalists in that Arcadia 8-lapper and top them all at the finish? What does it say about your fitness as compared to last December? I didn't really know much about the 3200 field this year. Of course I've followed the greats like Mac Fleet and Chris Schwartz, but I took their presence as more of a challenge than an inhibition. It feels really great to be competitive against all of these super XC racers. I don't think that I'm that much physically fitter than I was at the tail-end of the cross country season, just a lot more sharp and mentally ready. 3) When we spoke after Arcadia, you mentioned you stuck around after your race to watch the other events, and I know you were on the railing for the boys mile, in which you were originally entered. Strictly as a fan of the sport, what did you see at Arcadia this year that impressed you? What performances did you walk away still thinking about? Yeah, the boy's mile was pretty cool to see. McGregor's pace-setting was really admirable, and of course Elias's kick was super. 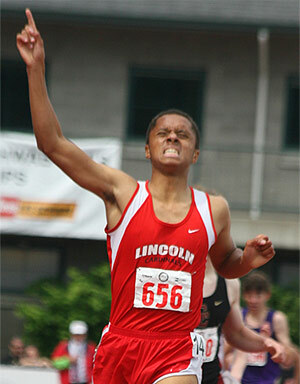 You can't walk away from that meet without shaking your head at Trevor Dunbar's awesome performance. Running a 5k alone is no joke, but doing it as fast as he did is quite remarkable. The real standout races for me were actually the distance relays, though. The boys from Dana Hill rocked it in all of them. Their tenacity was inspiring. 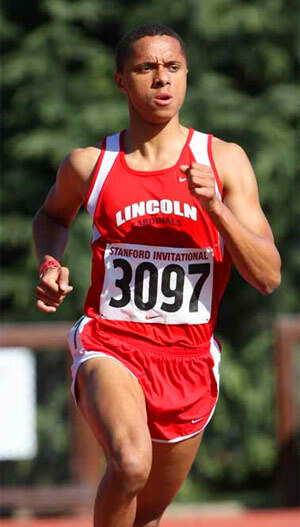 4) You're certainly someone who has carved out his own path to success in Oregon prep circles, not running cross country for your high school in the fall the last two years (even though you're considered one of the top distance guys in the state), and then competing for Lincoln on the track in the spring. I know there have been critics of that approach-- has it been difficult to stay true to your path in the face of some of that, and do you feel your successes (6A state title in the 1500 last spring, age group championships and records in the summer, Gatorade Track AOY for Oregon in 2008) validate the decisions you and your family have made? I see Track and Field and Cross Country as having two distinctive aspects: an individual component and a team component. Ultimately, both are very important when taking a wholistic look at the sport. But they don't have to be mutually exclusive. When the team component starts to interfere with my own individual performance, I just can't sit and let that happen. When I run as fast as I possibly can with training that works for me, the team benefits as well. I'm not really one for seeking validation from others, though. My running is, and will remain, a means for me to test my personal limits. 5) I've had the pleasure of meeting your former coach, Julius Achon, the Ugandan Olympian, on a few occasions; he's a very impressive person. Can you talk about what you've learned from Julius, how you first got hooked up with him as a coach, and how he's made you a better runner? Julius really is quite a guy. I first met him about 4 years ago, at Lincoln. I think I was running an interval workout and Julius was doing a workout of his own. My dad started talking to him when I was cooling down, and we started a casual training relationship which soon grew into a more serious coach/athelete set-up. Julius and his story are inspirational for runners everywhere, and training under him has given me some lessons which I'll carry with me for the rest of my runner career. He'd tell me to run like a soldier, something which I try to do in all of my races. 6) Fans of track and field love matchups, and Oregonians have a great one this year in the mid-distances, with you and Elijah Greer both competing in the 6A classification. As the two guys in Oregon with the potential to push low 4-minutes in the mile right now, do you think we'll see you and Elijah hook up for a really fast four-lapper this season, and is that something that even fits into your plans for 2009? I'm positive that Elijah and I will go head to head in some miles and 1500s through the late season and into the summer. We both have the potential to be at the top of the nation in those events. The mile has always been my favorite event and I would never dream of a season where I didn't try and run it as fast as I was capable. 7) Besides all of your accomplishments on the track, I've heard you also have a passion and commitment to the debate team at your school. Can you talk about how you balance the two, and what doors have been opened for you as a result of your involvement in debate? And did I hear you were also involved in the theatre at Lincoln? If so, what show(s), what role(s)? I've always been big on balance. No one aspect of my life has ever really dominated the rest. Sure, Track is a massive part of who I am, but it's still just that, a part. I've always had a passion for public speaking and logical analysis, so debate is perfect for me. I actually plan on representing Lincoln at the State Speech Tournament next weekend. Debate gives me the confidence to engage with almost anyone on an intellectual level, something which I might have otherwise been intimidated from doing. I've done two plays at Lincoln, both written by my fellow students. I won't go too much into it, but at one point I was conjoined to another actress in a large pink pajama suit. I'll leave the rest up to the imagination. 8) I understand you've committed to attend Princeton University next year, where your older sister, Bianca, is a student-athlete on the track team. How was the college recruiting process for you, overall, and what was it about Princeton that sealed the deal for you? What will it mean to again be teammates with Bianca, who I know was instrumental in getting you involved in the sport in the first place? The recruitment process was amazing. My recruitment trips were probably some of the most fun I've ever had; all of the athletes and coaches around the country were very accomodating and friendly. Ironically, my trip to Princeton fell in the middle of their mid-terms. They were probably three of the most interesting days of my life. I said to myself, "If this school is this incredible during mid-terms, what's it like the rest of the time?" The coach there took a real interest in me, and I believe that working with him will allow me to achieve anything, track-wise. Of course, I miss being on the same team as Bianca. Lincoln's not quite the same without her. I think that we inspire each other to compete at the highest level we can.